Rupes Altai is a cliff running almost 300 miles long and 3000 feet high. 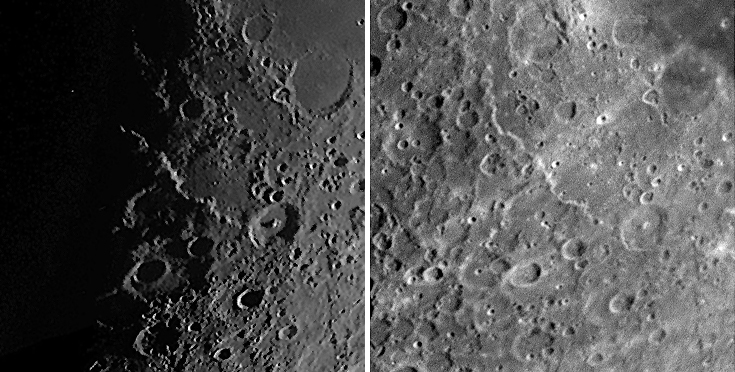 The image on the left was taken with the Moon at about 5 days lunation whereas the image on the right was taken with the Moon at about 8 days lunation. Between these images we can see the dramatic difference in the albedo (or reflective properties) of the lunar surface with different angles of the Sun. The large ray running from the bottom left corner to the top right corner is from the impact crater Tycho. Rupes Altai is nearly invisible when fully illuminated at Full Moon.